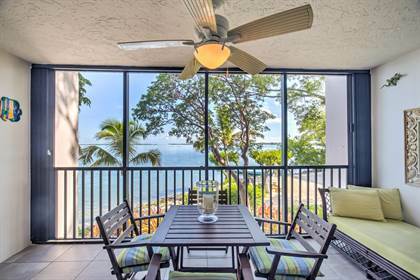 Picturesque Views of the tranquil blue waters of the Florida Bay will captivate you in this nicely updated 2 bed, 2 1/2 bath Bay Front condo. This corner condo offers plenty of windows for natural light. Featuring open concept floor plan, extended master suite, and bayside screened porch. Offered fully furnished. Rock Harbor Club offers Resort style amenities on 10 acres of lush tropical landscape. More... Great boating right off the Intracoastal waterway with (optional) community dockage, care free in & out dry rack boat storage, temperature-controlled pool, tennis courts, basketball, kayak launch, bay-front club house with saunas, fire pit, sandy beach & amazing sunsets! Hi, I'd like to find out more information about 97652 Overseas Highway. Thanks so much!